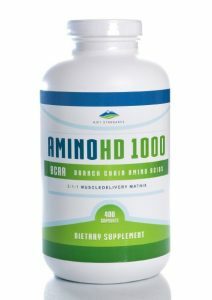 Branched chain amino acids or BCAAs are a group of essential amino acids that are not produced by the body but are needed by the body. There are 3 BCAAs in total called leucine, valine and isoleucine. They account for up to 35% of all muscle proteins. When your glycogen stores are running low or empty, BCAAs are what your body relies on to fuel it in replacement. As you can only get these amino acids from food or supplements, it becomes quite clear why BCAAs are an extremely popular sports supplement. Here are 5 proven benefits of BCAAs. One of the most popular reasons for BCAA supplementation is its ability to improve exercise performance. In one study focusing on 218 marathon runners, BCAA supplementation was found to improve both mental and physical performance. Running times of slower runners improved, however faster runners did not experience an improvement in the time they ran. Both types of runners experience improved mental performance (​1). Although physical performance wasn't improve for both runners, their mental performance was which is half the battle when it comes to performing well in a workout. Another study looked at the effect of BCAA supplementation on lactate threshold, as a measure of exercise capacity. It found that those who consumes a BCAA drink with high leucine content in particular, had higher VO2 scores and work levels at lactate thresholds compared to a control group (​2). 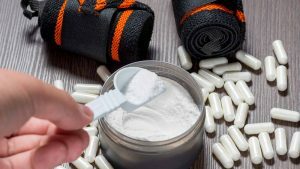 This suggests BCAAs may be an effective way to improve your exercise capacity and endurance, therefore improving your ability to perform during your workout. Another study of 36 men found that BCAA supplementation increased muscle strength more than whey protein or carbohydrates. Muscular strength was significantly greater in the group that took 14 grams of BCAAs in a sports drink during an 8 week resistance training program, compared to those who consumed 28g whey protein or 28g of carbs with their sports drink (​3). This implies that the BCAAs helped participants exercise performance and thus they had greater gains. Another study showed that leucine supplementation could improve power production. 13 competitve canoeists were divided into 2 groups with one group taking leucine and the other a placebo. Researchers found that those who consumed leucine dramatically increased muscular power production after 6 weeks supplementation compared to the placebo (​4). The improvement in power production is considered the most important factor in improving exercise performance. 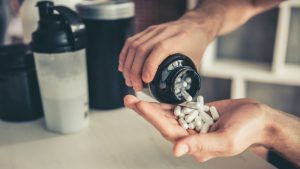 However it is worth noting that although BCAAs can help improve your performance and subsequently the gains you make, it should be noted that excessive use of BCAA supplementation will have the opposite effect. Although this study was performed on rats rather than humans, it is worth noting that too much BCAA supplement consumption may result in a reduce exercise performance, so it is wise to monitor your usage accordingly. More is not better in this case. Another popular reason for using BCAA supplements is to increase muscle growth. In particular it is the BCAA leucine that is particularly important for muscle growth. Leucine activates a particular pathway in the body that triggers muscle protein synthesis after exercise and thus makes muscles (​6). One study had people consume a drink containing 5.6 grams of BCAAs after their workout. They had a 22% increase in muscle protein synthesis compared to those who consumed a placebo (​7). However it is also worth noting that this increase in muscle protein synthesis was around 50% less than what has been observed in another study. This study showed that a low dose of whey protein with leucine or all essential amino acids was just as effective as a complete protein (whey) in stimulating muscle protein synthesis. However it was whey ALONE that was able to sustain increased rates of muscle protein synthesis post exercise, where as leucine was not able to (​8). This suggests that although BCAAs can increase muscle protein synthesis, they can't do it at a maximum capacity without the other essential aminods, therefore a complete protein source like whey may be more beneficial (​9). We all know what muscle soreness feels like a day or so after a workout. It can be quite painful or it can be quite mild. Reducing it is always going to be a bonus. Some research suggests that BCAAs may help reduce muscle soreness or delayed onset muscle soreness (DOMS). Muscle soreness opccurs as a result of tiny tears in the muscles after exercise. Inevitability to grow strong or get faster muscles get damaged and then rebuilt. BCAAs have been shown to decrease this muscle damage which could help reduce the length of severity of muscle soreness after a workout. One study showed that people who supplemented with BCAAs before performing a squat exercise experienced a significant reduction in muscle faitgue and muscle soreness than a placebo group (​10). One study looked at the effects of BCAAs on serum indicators of muscle damage after exercise. They found that BCAAs decreased levels of creatine kinase and lactate dehydrogenase which are both indicators of muscle damage. This suggests that BCAAs may reduce muscle damage associated with endurance exercise (​11). BCAAs therefore may be a good supplement to take to reduce muscle soreness by reducing the damage done to your muscles exercised. It's ability to reduce lactate dehydrogenase is also a strong sign that it may also help athletes train hard with less muscular damage. Exercise fatigue is something we all experience and on some occasions we may tire more quickly than others. There are lots of factors that can contribute to this. You may have had a stressful day, the intensity of your exercise may be greater or longer than normla, your nutrition beforehand may have not been great. It all contributes. BCAAs have been shown to help reduce this fatigue by essentially not letting your brain give up on what you are doing. When you workout, BCAA levels in the blood fall as a result of being used up by the exercise you are doing. When they fall you experience an influx of the essential amino acid tryptophan in the brain. This results in the production of serotonin which causes you to feel fatigued. One study had participants take 300mg a day of BCAAs for 3 days and then complete an exhaustive exercise trial. Those who had taken the 300mg a day had greater resistance to fatigue compared to those who were given a placebo. They also had a reduced respiratory exchange ratio and higher plasma glucose during the test (​12). This suggests that BCAA supplementation increases your resistance to fatigue so may be useful for help you stay mentally focused when doing intense workouts. If you workout a lot or have an intense training program, you may find that your immunity is lowered. This is usually evident to you because you'll find you get sick more often or pick up colds like they are in fashion. If you training isn't heavy or intense, you should be find. Even so BCAAs have been shown to improve the immune system. Research looked at the effect of BCAAs on the immune response of athletes after an Olympic distance triathlon. They found that those who supplemented with BCAAs maintained their blood glutamine levels before and after the triathlon whereas the placebo group has a reduction in blood glutamine of 23% (​13). Glutamine stores are used by the body as cellular energy for the immune system, so keeping them topped up is important for immunity. BCAAs can be helpful in keeping them topped up during and after intense workouts. 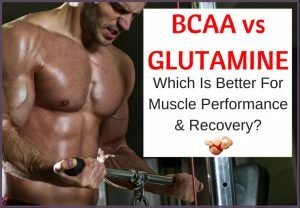 Other research has suggested that besides keeping glutamine levels up, BCAAs are fundamental for immunity. As mentioned, BCAAs have been shown to increase muscular protein synthesis and this seems to be what the immune system used BCAAs for. It has a high dependence on BCAAs. If the body doesn't have enough BCAAs then the likelhood is that the immune system will be impaired (​14). BCAAs have been shown to improve the health of those with cirrhosis. Cirrhosis is a chronic disease where the liver has irreversable scarring and liver cells are lost. The liver doesn't function properly anymore. Thos with the condition may experience jaundice, easier bruising and itching to name a few issues. Cirrhosis is common linked to alcohol abuse. Around half of people with cirrhosis will develop hepatic encephalopathy which results in patients experiencing impaired brain function. This can result in confusion or memory loss as well as other impairments. This is because of the liver is unable to remove toxins from the blood due to its impaired function (​15). BCAAs may have a beneficial effect on the symptoms of patients who have hepatic encephalopathy. Another complication arising from cirrhosis is hepatocellular carcinoma. This is the most common form of liver cancer. Some studies have shown that taking BCAAs could help protect against liver cancer in those with liver cirrhosis (​17). Branched chain amino acids are a group of 3 essential amino acids that the body cannot produce itself; they must be obtained by eating food that contains it. BCAA supplements have shown to improve exercise performance, increase muscle growth, decrease fatigue and muscle soreness, improve the immune system and be beneficial to patients with liver cirrhosis. Generally most people consumer enough through their diets and may not need to supplement to gain additional benefits. However if you are a heavily active lifestyle and want to get the most out of your workout routine, you may find they give you the mental boost you need to make the gains you want.